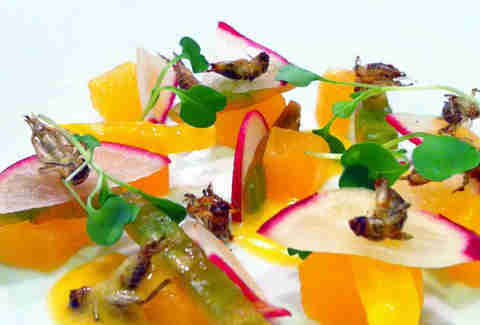 Chili-Lime Cricket Salad with Compressed Melon, Heirloom Tomato, Cucumber and Honey Lime Vinaigrette: Inspired by either a salad the Chef saw while in Mexico or his hatred for that top hat-clad bug that acted as Pinocchio's conscience, this dish involves boiling, frying and tossing the crickets with lime juice, zest, salt & cayenne pepper, then scattering them over veggies and melon (which itself is cut and marinated under pressure with lime and habanero olive oil). BBQ Baby Lamb Sweetbreads: Pretty self-explanatory, except to say that these sweetbreads aren't exactly those things you get recently leavened from the bakery. Mostly because they're made of pancreas. 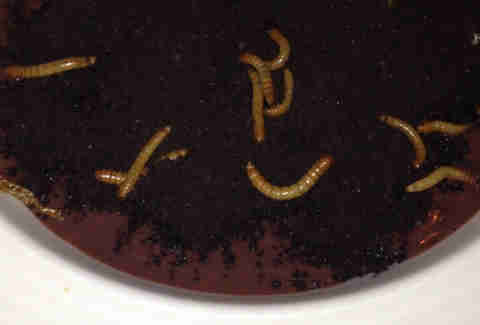 "Dirt and Worms" Dessert: Don't worry, you're definitely not eating dirt. It's ground up chocolate. But actually, do worry, you're definitely eating worms, though they have been sitting in a jar eating nothing but basil for 48 hours before you bring them to their swift and final justice.